"maybe but maybe not..." i mumbled. Kouga would tilt his head and hold out his hand. " well?" "i guess..." i said grabbing his hand. "he's probably back from Kikyo by now..."
as Kouga carries me i then think about Kikyo and i look blankly at the ground. "yeah the well please i don't wanna see Inuyasha right now..." i said nervously smiling. as i watched the scenery fly past by me i thought about what Kikyo and Inuyasha could have talked about. "bye thanks Kouga." i said trying to smile. a i lifted my leg to get in the well i looked back at Kouga for a few seconds and jumped inside. after jumping inside the well and the well shined all around, i landed at the bottom and climed up the latter the reached my world. as i got out of the well and saw that my little brother Sota was playing outside playing with his soccer ball again. "oh welcome home Sis!" Sota greeted. "Hey!" i greeted back as i came out of the shrine and walked towards my house. as i walked in my house i realized that i was super hungry once i smelled my mom's cooking. "i'm home!" i shouted throughout the house as i entered. "welcome home Kagome!" i heard my mom greeted as i walked into the kitchen seeing my mom cooking and was setting some plates on the table. "Oh! welcome home Kagome!" i heard my Grampa greet me coming into the kitchen as well. "hey Mom, Grandpa." i greeted them. 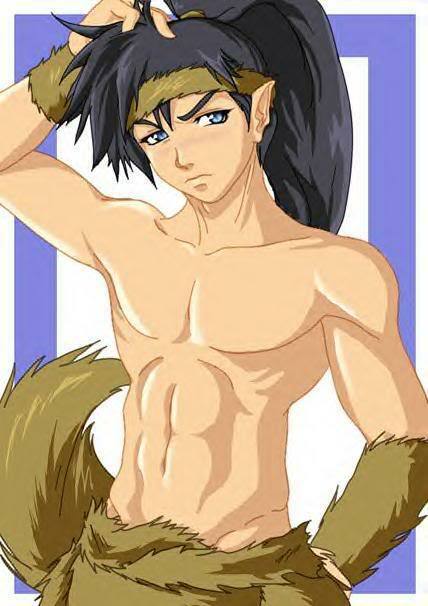 Kouga would stop and take a break at the border of wolf territory. As I would smell a familiar scent get nearer and nearer! As Sota came into the kitchen as well we all stat down at the table and started eating. while i was just about finished eating the kitchen door soon slams open revealing the half demon with a red outfit and white hair and dog ears, who was of course Inuyasha. "Who the hell said that you can go home?!" Inuyasha said looking at me. i turned around and looked at him while i stuffed the fried shrimp in my mouth to talk. "i did!" i let out after swallowing the fried shrimp. "besides no one says that i have to tell you everything i do." i let out turning back around as i then finished my food. "Okay! now that you're done eating let's go back!" Inuyasha said pulling my arm dragging me into the well and into the past. "will you at least let me get ready?!" i asked slightly angry at his forcefulness as i glared at him. Kouga would take a step back once more " ah crap." he says as his left eye twitches. Ayame would glare for she still remembers my promise to her when she was a child. Which doesn't count due to I was trying to cheer her up. Except she got obssessed and not it's not just a imaginary promise but a actually promise to marry her.